Risk assessment, commonly identified as a required “step” in the remedial investigations at federal superfund sites, is now commonly employed as part of the decision making process in a wide spectrum of federal regulatory programs, state hazardous materials programs, and scientific applications. This article describes the broad applications where regulators, scientists, and engineers apply risk assessment within the context of characterizing environmental exposures and making decisions regarding the implications of those exposures. incorporates a detailed conceptual model that encourages broad considerations of potential exposures and pathways, and facilitates input of stake holder’s specific concerns. Initially, the regulatory requirements of the United States Comprehensive Environmental Response, Compensation, and Liability Act(CERCLA) largely drove the development of risk assessment methods within the United States Environmental Protection Agency (EPA). The EPA continues to be a major source of information and innovation in the development of human health and ecological risk assessment methods (http://www.epa.gov/risk_assessment/). 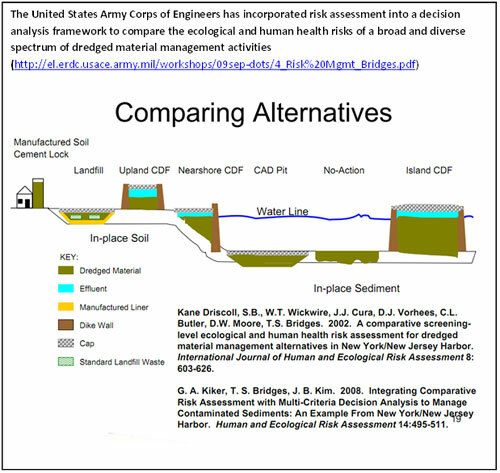 Incorporation of risk assessment into a multi-criteria decision analysis system (http://el.erdc.usace.army.mil/elpubs/pdf/eqt-10-2.pdf). Despite much discussion about the Precautionary Principle in international circles, the international scientific community has taken specific steps to incorporate ecological and human health risk assessment into their approach to environmental problem solving. 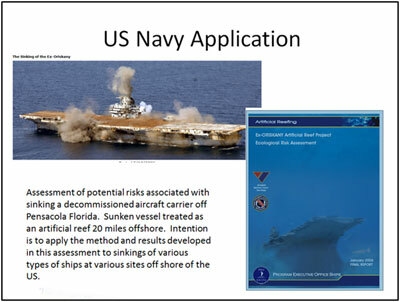 The International Navigation Association, building on the USACE efforts at guidance development, has published an international standard for risk assessment for dredging and disposal operations in ports and harbors (http://www.pianc.org/technicalreportsbrowse.asp). The United Nations Food and Agriculture Organization has published a broad review focused on the importance and application of risk analysis to seven major risk sectors of aquaculture production: pathogen risks, food safety and public health risks, ecological (pests) risks, genetic risks, environmental risks, financial risks and social risks. (http://www.fao.org/docrep/011/i0490e/i0490e00.htm). The International Union of Pure and Applied Chemistry is currently developing risk assessment guidance for assessing the risks posed by pesticides at agricultural site (http://www.iupac.org/web/ins/2010-056-1-600). Although ecological and human health risk assessment methods have only developed over the past twenty years, they have found and continue to find broad application in a wide variety of national and international programs. The flexibility, versatility, and mandated transparency of the method makes the general approach applicable to a broad range of environmental problems from site specific issues to using the approach in a comparison of alternatives or technologies.